We’d love your help. Let us know what’s wrong with this preview of Murder has no Guilt by Phillip Strang. A mass shooting. An amoral Romanian gangster. A Russian oligarch who claims to be an honest businessman, but isn’t. No one knows who was the target or why, but there are eight dead. The men seem the most likely, or could have it been one of the two women, the attractive Gillian Dickenson, or even the celebrity-obsessed Sal Maynard? There’s a gang war brewing, and if there are deaths, they don’t care as long as it’s not one of them. But to Detective Chief Inspector Isaac Cook, it's his area of London, and he needs to find out who killed the eight. It’s unpredictable, and initially, it had been the West Indian gangs that had held sway in the area. But then, a more vicious Romanian gangster had usurped them. And now he’s being marginalised by the Russians. And their leader is the head of the most vicious Russian mafia organisation, and he’s got residency in England, as well as money and influence, the ear of those in power. To ask other readers questions about Murder has no Guilt, please sign up. Australian author Phillip Strang has gained his platform as an adventure writer through his career installing telecommunications networks in many remote and exotic parts of the globe, including time spent in Afghanistan and Pakistan - an experience that allowed him to gain direct insights in to the ongoing conflicts there. He has also spent considerable time in Africa including Liberia, Nigeria, and Guinea. It is this direct contact with troubled countries that gives his books intense credibility: he has first hand contact with the events he shares in his books such as DCI Cook Thriller Series, of which this is Book 6 – the first books are 1- MURDER IS A TRICKY BUSINESS, 2 - MURDER HOUSE, 3 - MURDER IS ONLY A NUMBER, - 4 MURDER IN LITTLE VENICE, 5 - MURDER IS THE ONLY OPTION, 6 – MURDER ON NOTTING HILL, 7- MURDER IN ROOM 346, 8 – MURDER OF A SILENT MAN and now 9 – MURDER HAS NO GUILT. But it takes more than on the spot witness to bring the story Phillip has written to life in the format of a book - and that is where he towers above others creating novels with similar storylines. To bring a story of this magnitude into focus it is imperative that the foundation of the place and the people are presented accurately in order to bring the terror that is to come to meaningful life. Phillip sets his stage well form the very first page and continues that degree of suspense throughout. We never tire of DCI Cook’s personality or adaptability or ingenuity. When are the best leads from the crime bosses….? when you don’t have any others? A mass shooting. An amoral Romanian gangster. A Russian oligarch who claims to be an honest businessman but isn’t. No one knows who was the target or why, but there are eight dead. The men seem the most likely, or could have it been one of the two women, the attractive Gillian Dickenson, or even the celebrity-obsessed Sal Maynard? There’s a gang war brewing, and if there are deaths, they don’t care as long as it’s not one of them. But to Detective Chief Inspector Isaac Cook, it's his area of London, and he needs to find out who killed the eight. It’s unpredictable, and initially, it had been the West Indian gangs that had held sway in the area. But then, a more vicious Romanian gangster had usurped them. And now he’s being marginalized by the Russians. And their leader is the head of the most vicious Russian mafia organization, and he’s got residency in England, as well as money and influence, the ear of those in power. What did I like? I have read all but two of this series and I believe that this is the best of all of them. I have the other two on my TBR list, so I will have soon read the whole series. If you have read any of the series you know that DCI Cook has had mega troubles with his bosses and with this being one of the more complicated cases that he has had, they have been steaming down his neck. I love his attitude and his dedication to the murder cases that he has come up against. What will you like? Well written with a ton of twists and turns that will set you up for whiplash, without a doubt. The characters are interesting and some just darn down and dirty criminals. The action is incredible, new and stimulating situations, thought-provoking, along with a fascinating outcome. I really liked the interaction between the countries and how they worked together even though they had their own murders to solve. I received this from the author for an honest review with no other compensation. The deaths in the mass shooting are, of course, not the A mass shooting in a high-end hair salon for men is the start of a big problem for DCI Isaac Cook and his team. Even the minor local mafia boss doesn't seem like a likely target for this type of killing. But as Isaac and his team keep digging, it begins to look like it had nothing to with anyone there--and everything to do with a brewing gang war between a Romanian gang well established in the area, and a major Russian mafia gang moving in. All the characters have more than just one layer, even the worst criminals. For our recurring characters, they continue to develop into every more fully-fleshed characters, and their lives progress, as age, relationships, and experience all have their effect. Strang is just really good at this, and keeps turning out highly readable and satisfying police procedurals about convincingly real characters. Very much recommended. A gunman walks into a high-end London hair salon and opens fire, killing the owner, two staff members, and five customers. For DCI Isaac Cook and his team, the race is on to find the killer, but they must start with a relatively blank slate. At first, there’s no motive, but as they begin to look under the rug, they find much trash: a ruthless Romanian gangster and his henchmen, a Russian oligarch with an impeccable reputation in England, but who heads one of Russia’s top mobs, and assorted other A gunman walks into a high-end London hair salon and opens fire, killing the owner, two staff members, and five customers. For DCI Isaac Cook and his team, the race is on to find the killer, but they must start with a relatively blank slate. At first, there’s no motive, but as they begin to look under the rug, they find much trash: a ruthless Romanian gangster and his henchmen, a Russian oligarch with an impeccable reputation in England, but who heads one of Russia’s top mobs, and assorted other bits of flotsam and jetsam of England’s criminal underworld, all come together in a maze that foreshadows a possible gang war, and more blood on the streets. Cook and his crew not only have to deal with the criminal bad guys, but with the bureaucratic and sneaky weasels in their own organization, who are more interested in making points than solving crimes. 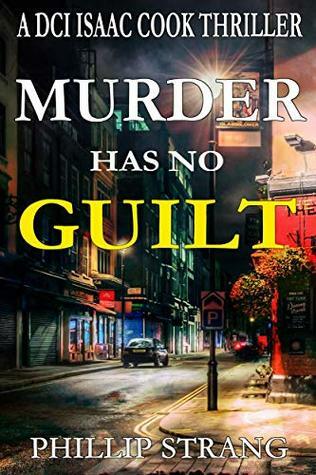 Murder Has No Guilt by Phillip Strang is another outstanding chapter in the adventures and misadventures of the indomitable DCI and his band of merry men and women, as they face danger and duplicity with their usual dogged persistence until the guilty—or most of the guilty—are brought to justice. I’m a fan of this series, which never disappoints, nor does it become boring, with each story building on the last and keeping you reading until the end. I received a complimentary copy of this book in exchange for my unbiased review. I give it five stars without hesitation. Phillip Strang has written a thriller that realistically depicts the issues that police encounter when investigating a mass murder that involves international gangs. After a mass murder occurs in an exclusive barber shop, DCI Cook and his team are called to find the killer. The deceased include a tv star, his girl friend, a local girl who was harassing the tv star, and a barber with questionable side jobs. The team must solve the murders as higher ups in the police force look for ways to take ov Phillip Strang has written a thriller that realistically depicts the issues that police encounter when investigating a mass murder that involves international gangs. After a mass murder occurs in an exclusive barber shop, DCI Cook and his team are called to find the killer. The deceased include a tv star, his girl friend, a local girl who was harassing the tv star, and a barber with questionable side jobs. The team must solve the murders as higher ups in the police force look for ways to take over the investigation. The team must determine who the intended victim was and the investigation lead the team into the gangster world of London and to the society of London's lower classes. The Russian mafia makes a play to take over the local drug business while the local Romanian king pin wants to thwart and take over the action. The characters are well drawn and their cultures appear realistic. The personal lives of the characters are interesting and plausible. This story is entertaining and plausible with the ending being most realistic. Highly recommended reading. "Ripped straight from the day's headlines"
This isn't fake news, it's the real thing. In your face, with no holds barred. Isaac Cook and his colleagues are fighting crime with one hand tied behind their back. Everyone on the wrong side of the law is scared of the Romanians. The London gangs were tough, the West Indian Yardies were ruthless, but they were swept aside by the newcomers. They ruled the roost, until the day the Russians decided they wanted a piece of the action in the English capital. "Ripped straight from the day's headlines"
What can be done in a country where law and order rule,where even the badguys are innocent until proven guilty? What can be done if the police know, beyond a shadow of a doubt who the master mind is but they have no evidence for a court of law? This book really makes you consider all of those thoughts. Another excellent read by Phillip Strang. International gangs playing ruthless, with mass murders and more, Isaac knows who they are, getting the evidence or someone to come forward, won’t happen Upscale hair salon, a tv star, a girl harassing him, side jobs of the barber. a lot of motive for Isaac’s team to look into. Answers came unexpected, well written to figure out. Characters seem two dimensional, dialogue is stilted. No passion from any of the characters, just sentences with as few words as possible. This book starts well, as it's quick, precise and very captivating, but then it's downhill. There's not as much detecting by the police as circumstances that solve crime, and the last half of the book is more like nonfiction than fiction. I believe the author has done, and can do, better. 3.5 stars. Subject matter is good. However, the book (and series) lacks any significant character development and the ending are generally very abrupt. Lots of conflict and murders. All three factions of the bad guys fight it out in the streets. The winner gets the drugs and distribution in England. Phillip Strang is a well-travelled writer who has spent considerable time in many remote and exotic parts of the World installing telecommunication networks. A number of years in Afghanistan and Pakistan have given him a good insight into the culture of both of these countries, and an understanding of the problems they jointly share. In recent years, there have been extended periods throughout many Phillip Strang is a well-travelled writer who has spent considerable time in many remote and exotic parts of the World installing telecommunication networks. In recent years, there have been extended periods throughout many countries in Africa including Liberia, Nigeria, and Guinea.